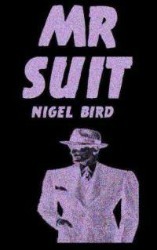 "‘Mr Suit’ is a tense and thrilling novella..."
Archie works for local gangster Mr Suit, or at least he did until a bullet left him with Locked-In Syndrome. Now he's imprisoned in his own body. Reliant on his wife Liza he can only communicate by blinking. Archie craves a dignified exit from his life and to help him, Liza arranges for Mr Suit to euthanize him. Unfortunately things go terrifically wrong and chaos ensues as Liza ends up fighting Mr Suit for her own life. Nigel Bird is one of the better known writers among those who have plied their trade on the internet and in various anthologies. With 'Mr Suit' he shows the wealth of experience he has gained from this medium. The prose is tight rope taut and the plotting first class. The central character of Liza is well drawn and the drip feed of her commentary about Archie's feelings is brilliantly done. Mr Suit is suitably odious without straying in to cliché. All in all 'Mr Suit' is a tense and thrilling novella which deserves a place on your bookshelf. "...there is an ever growing sense of urgency as events spiral out of control." When a successful businessman is brutally murdered, the finger of suspicion points to his glamourous wife and her toyboy lover. When the bodies of his business partner and a third man are found with the same injuries the police are bewildered. The only clue for DI Geraldine Steel is DNA which leads her down a series of dead ends. Can she solve the case before the killer strikes again? 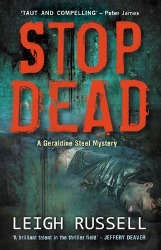 'Stop Dead' is a whodunit of the highest order. The tightly written plot kept me guessing all the way. Yes I had the clues and was close to the identity of the killer in one sense, but in another way Russell beat me – in the battle of wits between author and reader – as she has created an intricate plot with mystery on multiple levels. The pace increases as the pages turn and there is an ever growing sense of urgency as events spiral out of control. Geraldine Steel is a strong lead and I particularly like the way Russell is slowly revealing her back story over the course of the series. Sam is a decent partner who complements Steel rather than competing with her. Amy and Guy are carefully drawn and the snapshots of the killer are artfully constructed. With its neat prose and heightening tension, 'Stop Dead' kept me entertained while I was suffering from a very severe bout of 'manflu'. Trust me, this book is a better remedy than Lemsip! "Hilton’s hit a home run with ‘Red Stripes’." Stephan, a young man from a rich family in Miami, and his girlfriend Wendy are kidnapped and held in Jamaica. After liberating them with his partner Rink, Joe realises on his return to Tampa that someone from the kidnapping gang is after him. His investigations lead him to the man responsible for masterminding the kidnap and extortion. This short story from Matt Hilton is true to the traditions of the gunslinger. It rides into town, saves the day and then disappears from sight but not mind. Hilton has the art of the short story down to a fine art and in 'Red Stripes' he uses every word to its full potential. Somehow he manages to acknowledge the full novels, his character's traits and fill the pages with action. Bullets fly and punches are thrown as Hunter and Rink rescue a young man and his girlfriend from kidnappers, before the final standoff when the boss man comes looking for Hunter. Download yourself a copy today and you will be rewarded with a first rate short story which will keep you going until the next novel comes along. 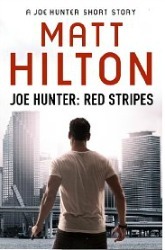 Hilton's hit a home run with 'Red Stripes'. "...the gripping new bestseller from the master of the race-against-time thriller." A threat has been made. An ultimatum delivered. Innocent people are in mortal danger. 8am: an explosion blasts through a café in central London. DC Tina Boyd and DI Mike Bolt have just twelve hours to stop the terrorists - before it's too late. 'Ultimatum' is the gripping new bestseller from the master of the race-against-time thriller. Kernick's latest features not only head strong detective, Tina Boyd, but also sees the return of one of the criminals featured in a previous novel of his. Whilst normally I find re-using criminals doesn't work, and plots tend to be rehashed, Kernick still manages to write an excellent thriller that is up to his usual high standard. Boyd is a complete loose canon that is constantly following trouble. Once she is involved you can be guaranteed that everything will get out of hand. Yet despite this and her unorthodox way of working, she still manages to get results. She is definitely a winning character. As with Kernick's previous novel, this one moves away from killers and murders in general and is based around terrorism on a large scale. And despite terrorism and attacks on the government still not being my genre of choice, Kernick's ability as an author means that whatever he writes about definitely keeps this reader interested. 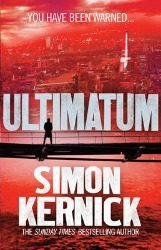 'Ultimatum' has a slightly fanciful plot, but it is no surprise that this author manages to pull it off. There is no real 'murder mystery' but this doesn't detract from wanting to know what happens and as always, Kernick delivers his book like a runaway locomotive without brakes. This is another cracking read from a great author. "...a definite page turner that once picked up cannot be put down..."
The MacBrides have always gone to Far Barn in Devon for Bonfire Night, but this year everything is different; Lydia, the matriarch, is dead. Her children also have their own problems whilst struggling to cope with this bittersweet annual celebration and their grief. Sophie, the eldest daughter, is desperately trying to repair a crumbling marriage whilst Felix, the youngest of the family, has brought a girlfriend with him - for the first time. The girlfriend, Kerry, appears odd but no-one can really say why and later they leave her looking after Sophie's baby daughter. However, on returning they find both Kerry and the baby gone which then leads to events that will change their lives forever. 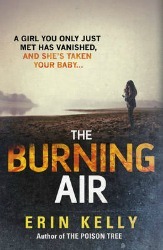 Following on from her two previous novels, 'The Burning Air' once again highlights the originality of Erin Kelly's plot lines and her ability to build anticipation that, in my opinion, is rarely matched by other thriller/suspense writers. Her ability of taking something everyday and warping it into something dark and twisted, whilst effortlessly weaving sequences from all parts of the characters lives is not something everyone can do. 'The Burning Air' is based around a family who have a secret in the past that comes back seeking vengeance. Told from different character perspectives in both the past and present, it brings to life a tale focussed on the extreme lengths to which revenge can be taken through an intricate story of twisted threads that begin to unravel slowly until disentangling rapidly to the resulting climax. Erin has the ability of starting at a point of normality and slowly unfolding the narrative in a way that intrigues. By balancing the delicacies of human nature and demonstrating how light can change to dark with changing circumstances, she takes you into the darkness and perversion underneath everything until providing a climax that is perfect for the book and the readers ongoing thoughts. This book is a definite page turner that once picked up cannot be put down, with an inventive plot and characters that grab you and hold on tight whilst steering you through the subtle complexities. 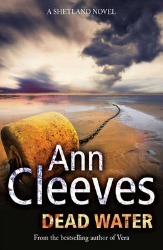 "Cleeves brings the Shetlands to life so vividly you can feel the salty tang on the breeze as you read her Shetland novels." It is six months since the death of the fiancé of Inspector Jimmy Perez of the Shetland police. Although back at work, he is not really engaged and suffers from depression and bouts of anger. When the body of journalist Jerry Markham is found in a boat close to the home of the Procurator Fiscal, Sergeant Sandy Wilson is reluctant to call out Perez. Detective Inspector Willow Reeves is brought in to head the investigation and Jimmy Perez is gradually drawn into the search for the killer. As always his deep knowledge of the people and ways of the islanders is invaluable. The victim is a native Shetlander who has returned from a successful career in London. When he left he was ambitious and anxious to make his way in the world. Just before he went he was involved with a young girl who was helping out in his parents' hotel. He moved on to new pastures but left behind a devastated young woman. Markham was apparently on the track of a big story, possibly involved with Sullam Voe, the terminal of the oil and gas business in Shetland. Perez and Reeves follow the leads and the past has many influences. Actions have consequences, even after many years. Perez's understanding of local people and Willow Reeves' determination to find the answer combine to help them track down the murderer in a tense finale. I was devastated at the end of 'Blue Lightning', the last of the Shetland quartet of books about Jimmy Perez. I had hugely enjoyed the series and Jimmy and Fran were favourite characters. So I was delighted that Jimmy has survived to live another day. 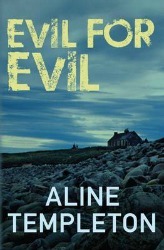 One of Ann Cleeves' strengths is her description of characters and her way of understanding exactly how people work. This continues in this book. Perez' depression and mourning is beautifully described, as is his slow emergence from the depression into which he has sunk. In 'Dead Water', Rhona Laing, the smart and ambitious Procurator Fiscal, becomes more of a real character as we learn more about her motivation and her strengths and weaknesses. The singular atmosphere of the Shetland Islands, both welcoming and insular, is, as always, an important part of the story. Cleeves brings the Shetlands to life so vividly you can feel the salty tang on the breeze as you read her Shetland novels. 'Dead Water' is another completely satisfying story and I, for one, am very pleased we are yet again in the company of Jimmy Perez. "...a very good opportunity to climb aboard and savour this writer's very addictive series." Faraday has gone, Winter is off the scene and their protégé, Detective Sergeant Jimmy Suttle has moved to the West Country to get away from the rising crime in Portsmouth. This is the beginning of a new series based in a different part of the world. Different pressures, different life styles but, as Jimmy Suttle discovers, still the relentless fight against crime. He likes the country environment but his wife is finding rural living in a house with major renovation issues a challenge. Suttle is set to investigate the murder of a businessman who is found on the ground outside his penthouse flat. He had recently completed and won a long distance rowing race with four others, all much better rowers than himself. One of them had lost his wife overboard on a cross-Atlantic row and had been under suspicion of murdering her. The victim had not been popular, resented for throwing his money around, and many of his contacts were not sorry that he had died, but who would gain by his death? The pressure to find the murderer means that Suttle is too busy to deal with the major problems with the house, and this leaves his wife, Lizzie, to look for another outlet for her energies. She takes up rowing, with Suttle's encouragement, and from there learns more about the life of the murdered man and his friends. Portsmouth and even Winter have not departed from Jimmy Suttle's life completely and make the odd cameo appearance. 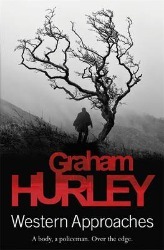 This is another cracker from Graham Hurley. I like the fact that there is not a complete break from the old series, but the change of venue and main character leads to a fresh view of the old problems. People are the same everywhere, and the pressures of the all consuming police life causes havoc on personal relationships anywhere. Hurley is very good at seeing how people react to real life as opposed to ideal situations. The characters do what people do, often stupid, usually selfish, occasionally self sacrificing and altruistic. At the end the murder is solved, but there are a host of unresolved issues which can only make you salivate and have to wait patiently (or impatiently in my case) for Hurley's next novel. This is a very good opportunity to climb aboard and savour this writer's very addictive series. Brilliant. "...more action than a Bond film..."
The Hunters are a team of renegades - an ex-military leader, a historian, a computer whiz, a weapons expert and a thief - financed by a billionaire philanthropist are tasked with finding the world's most legendary treasures. The Mission: recover a vast Romanian treasure that was stolen by the Russians nearly a century ago. Fearing a Germany victory in World War 1, the Romanian government signed a deal to guarantee the safety of the country's most valuable artefacts until after the war. In 1916 two treasure trains full of gold and the most precious objects of the Romanian state - paintings, jewellery from the Royal family, ancient Dacien artefacts - were sent to the underground vaults in the Kremlin only to be lost to the Romanian people forever as Russia severed all diplomatic relations with the country and scattered the treasure to its outlying regions. With a haul valued at over $3.5 billion dollars, everyone wants to claim the vast treasure but its location has remained a mystery, until now. Can the Hunters succeed where all others have failed? 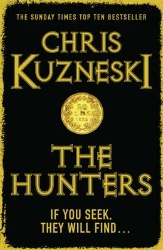 Chris Kuzneski is an author whose books I always look forward to and 'The Hunters' has only made me more eager for his next release. The dynamic of the group of hunters is well put together with each not only bringing a skill to the table but also a unique character trait. As a team they are greater than the sum of their parts which is the mark of any successful team. The caustic and ill informed McNutt was the one who stood out the most for me, and Kuzneski used him as the vehicle for the trademark humour that peppers his Payne and Jones series. Sweeping its way around Eastern Europe and Russia the plot holds you ever tighter as the page count rises. There are just the right number of twist and turns to make it interesting without the plot stealing the limelight from the action. The prose is neat and unobtrusive serving the story well. I particularly liked the opening to the novel which was a very clever way to introduce all the lead characters. With an ensemble cast, sweeping plots and more action than a Bond film, 'The Hunters' is a first rate action thriller that is sure to get your pulse racing. "'Notorious Nineteen' is another crazy, laugh-out-loud book peopled with the bizarre and the accident prone." After a slow summer of chasing low-level skips for her cousin Vinnie's bail bonds agency, Stephanie Plum finally lands an assignment that could put her check-book back in the black. Geoffrey Cubbin, facing trial for embezzling millions from Trenton's premier assisted-living facility, has mysteriously vanished from the hospital after an emergency appendectomy. Now it's down to Stephanie to track down the con man. Unfortunately, Cubbin has disappeared without a trace, a witness, or his money-hungry wife. Rumours are stirring that he must have had help with the daring escape . . . or that maybe he never made it out of his room alive. Since the hospital staff's lips seem to be tighter than the security, and it's hard for Stephanie to blend in to assisted living, Stephanie's Grandma Mazur goes in undercover. But when a second felon goes missing from the same hospital, Stephanie is forced into working side by side with Trenton's hottest cop, Joe Morelli, in order to crack the case. The real problem is, no Cubbin also means no way to pay the rent. Desperate for money - or just desperate - Stephanie accepts a secondary job guarding her secretive and mouthwatering mentor Ranger from a deadly Special Forces adversary. While Stephanie is notorious for finding trouble, she may have found a little more than she bargained for this time around. Then again—a little food poisoning, some threatening notes, and a bridesmaid's dress with an excess of taffeta never killed anyone... or did they? If Stephanie Plum wants to bring in a paycheck, she'll have to remember: 'No guts, no glory'. The disaster zone that is Stephanie Plum is back, together with exploding cars and copious amounts of fat laden take away food. Whatever Plum gets involved in turns into a nightmare. How she manages to earn a living is a mystery as she seems inept at everything she does. And her antics in 'Notorious Nineteen' are no exception. There are the usual shenanigans of Plum chasing the suspects and the comic escapades that her and Lula have. The plot is pretty transparent and it is easy to guess what is going on. But in-depth and intricate plots are not the reason for picking up an Evanovich novel. The reasons are her great, larger than life characters, unbelievable yet laughable events, and of course the love triangle of Ranger-Stephanie-Morelli. As usual Evanovich leaves Stephanie undecided and tempted. Lula continues to eat and grow and the hamster is the longest living rodent in any series of books. Yet despite there being no changes or major plot developments, I am hooked on Plum. 'Notorious Nineteen' is another crazy, laugh-out-loud book peopled with the bizarre and the accident prone. 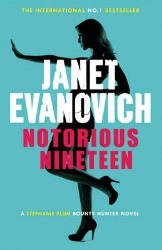 I have enjoyed all Evanovich's books from the very beginning and this is yet another delight to thrill her legion of fans. "I can always rely on Barbara Nadel for a roaring good story." Inspector Ikmen is invited to a charity fund raising event by his friend Arto Sarkissian. It is a murder mystery evening in one of Istanbul's glossiest hotels in aid of Arto's brother's project helping drug addicts. Agatha Christie once stayed in the hotel and the entertainment is being led by a group of professional actors. It is promised to be 'fun', a fact which fills Inspector Ikmen with dread. Only very reluctantly is he persuaded to attend. When one of the actors is discovered dead in the very room once used by Agatha Christie, things begin to go downhill. At the same time as the discovery, armed gunmen take over the hotel and start making demands. Ikmen is left with a challenge that has to be met in time in order to save lives. This is a game of puzzles with deadly intent and Ikmen and Suleyman rise to the challenge, although there are a few bodies left on the way. Inspector Ikmen is a down to earth, deep thinking man. He is compassionate and conscientious, but somewhat nostalgic for the old Istanbul. He is a contrast to the smooth aristocratic Inspector Suleyman. Together they provide a formidable team. 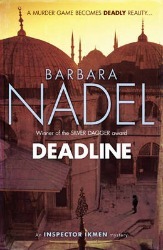 The plot of 'Deadline' is a little fantastical story - how many people have considered the possibility of a murder mystery evening turning into the real thing - but Nadel pulls it off with great style. This is no simple murder. There are evil machinations, revenge, greed and a convoluted plot to confuse and entertain. The usual characters are there and it is good to catch up with Ayse Farsakoglu and Izzet Melik and their tortured relationship. I can always rely on Barbara Nadel for a roaring good story. Her Turkish novels are set in an exotic background very familiar to her and completely authentic. 'Deadline' is no exception and is an excellent addition to this captivating and engaging series. 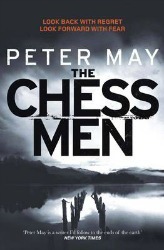 "From the beginning I was gripped by 'The Chess Men'..."
In this, the third book of Peter May's story of Fin Macleod, Fin is back in Lewis as a civilian working as head of security for a local landowner investigating an increase in poaching on the estate. When an unusual natural phenomenon results in a loch simply disappearing, the appearance of a wrecked small plane on the bottom of the loch starts a train of events that dig deep into the past of Fin and his old friend and maverick, Whistler Macaskill. The body found in the wreck appears to be that of Roddy Mackenzie, the leader of a successful Celtic rock band who had been piloting a small plane that had disappeared seventeen years ago. The group had started when Fin and Whistler were at school in Stornoway. Both were involved with the band and left it for reasons connected to the beautiful lead singer, Mairead Morrison. After Roddy's disappearance the band continued to flourish and the haunting music they produced remained very popular. The second funeral for Roddy Mackenzie reunites the band in Lewis, but feelings are running high. Fin is attacked when he goes to visit Whistler and secrets from the past drive the events of this story and the final revelation leaves Fin with an uncertain future but a resolve to support those who suffered from those events. In this book, Peter May investigates the influence of the past on the future. Events that took place in Fin's youth come back to haunt him and more particularly his friends. It is rather scary to think that unresolved issues, long buried, can have such devastating effects, but 'The Chess Men' reads true to life and in keeping with the slightly melancholic view of life that Fin Macleod carries with him. As always, the way of life in the islands, past and present , is beautifully described. The intense relationships and strong feelings of young people come to life both in the descriptions of the young Fin and his friends and in the characters of wee Anna and Fin's son Fionnlagh. Fin himself is a complex character. He has good motives but is a man of strong passions, who is carried along by the force of the moment. He is drawn back to his island home where there are the memories of his past but he is learning to understand himself more. May really gets under the skin of Fin and helps us to understand the various influences and decisions he makes. Above all this is a very good read. From the beginning I was gripped by 'The Chess Men' and I was compelled to carry on reading to the very end. This has been a remarkable trilogy from Peter May and one that will stay with me and one I am likely to re-read again and again. Sublime. "I just love these books!" A skeleton is found shackled to the rocks in a sea cave on a small island just off the south west coast of Scotland. Matt Lovatt, owner of said island which is called Lovatt Island, farms deer on the mainland nearby, having inherited the land from his grandmother. As the story develops he suffers a series of episodes of vandalism which indicate that he is unwelcome in the area. When investigations begin, Detective Inspector Marjory Fleming learns that the skeleton is not as old as originally thought as it is wearing a modern watch. As things develop it appears that long held resentments and secrets play a part in what has happened. Incomers are resented and hideous events from the past prove to be the cause of the murder. As always, Marjory Fleming is doggedly trying to trace the murderer as at the same time devoting herself to her family. Her long suffering husband and mother provide the stability for her teenage children, but not everything goes to plan. I just love these books! The characters are brilliant, eminently believable and sympathetic and Templeton has a fine ear for dialogue which always rings true. She also has a good supply of apposite Burns' quotes for her Sergeant Tam Macnee to bring out on all occasions. The interaction between her work colleagues, and the strains and joys of family life are beautifully described. The particular environment of a small town and country area, where everyone knows everyone and old quarrels last long, is set down to perfection. Using that, the plot develops strongly, and even those incomers to the town prove to have an interest in what has happened there in the past. I also like the family interest. The old problem of fitting meaningful relationships into a police career is solved by a very understanding and loving husband. The progression of Fleming's children, experiencing the trials of growing up and moving away, only add to the interest. As I wrote at the beginning of this review – I just love these books! 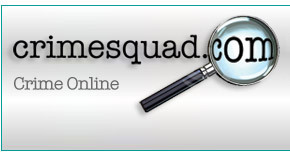 They are very much in the vein of Ann Cleeves and are perfect for anyone looking for a new writer to discover. You could do no wrong than to 'discover' Aline Templeton's Fleming series. 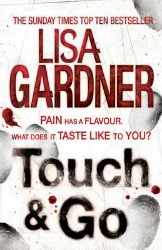 "'Touch and Go' is, as expected, a storming read from Gardner and definitely not one to be missed." Justin and Libby Denbe have the kind of life you'd find in the pages of a glossy magazine. A beautiful fifteen-year-old daughter. A gorgeous brownstone on a tree-lined street in Boston's Back Bay neighbourhood. A great marriage, admired by all. A perfect life. When investigator Tessa Leone arrives at the crime scene in the foyer of the Denbe's home, she finds scuff marks on the floor and a million tiny pieces of bright green Taser confetti. The family appears to have been abducted, with only a pile of their cell phones and electronic devices remaining. No witnesses, no ransom demands, no motive. Just a perfect little family, gone. Tessa knows better than anyone that flawless fronts can hide the darkest secrets. Now she must race against the clock to uncover the Denbe's innermost dealings, a complex tangle of friendships and betrayal, big business and small sacrifices. Who would want to kidnap such a perfect little family? And how far would such a person be willing to go? 'Touch and Go' is one of those books you race through as you have to find out what happens. But at the end you wish you had not read it so quickly as you enjoyed it so much you want to still be reading it! Written giving the views from both the detectives, and that of Libby who has been kidnapped, Gardner doesn't just flit from one to another, but spends plenty of time at each scene giving the reader enough information and perspective. The plot is simple enough - a family kidnapped and held to ransom. But as time progresses, the story starts to unravel and the plot thickens. By around page 400 I had worked out who was behind the kidnapping. By the end of the book I was totally wrong! Each character has a motive for carrying out the kidnap, but once the culprit is finally revealed, it was not who I was expecting. A riveting read from Gardner, as usual. A definite plus from me was Gardner moving on from characters such as Kimberley and Quincy Pearce, and using newer characters from other books like Tessa Leoni. Familiarity of names but a chance to get to know them in more depth. Wyatt was also a definite hit for me and I would like to see him feature in future books. 'Touch and Go' is, as expected, a storming read from Gardner and definitely not one to be missed. "...shows enough promise to make me want to read his next book." Professor Arno Holmstrand is about to die, his life about to be ended by an organisation intent on taking possession of his secret. Namely the whereabouts of the supposedly destroyed Library of Alexandria! Emily Wess's life is about to change forever. One minute she is a history professor and the next she is jetting around the world deciphering the clues Holmstrand has left her. Hot on her heels are the Council – a murderous organisation whose goal is the seizure of the library and the knowledge it contains. This is A.M. Dean's first novel and for such a high concept idea it is very well executed. There is a constant stream of action and although there is a lot of information imparted to the reader it is all relevant to the plot and there for good reason. The lead of Emily Wess is well constructed although the reader does have to suspend disbelief to the point of snapping at her involvement in the hunt for the library. 'The Lost Library' is basically a form of an Everyman novel and I once or twice found myself questioning her reasons to continue the chase. The mysterious Antoun and the deadly Jason added to the drama as required and other minor characters all ticked the right boxes. The plot is cleverly adept although I would have preferred a double cross or a blind-siding twist or two to really ramp up the tension further. While the pacing of 'The Lost Library' kept me turning pages at a frantic rate, I could have guessed without being told that this was a debut novel. 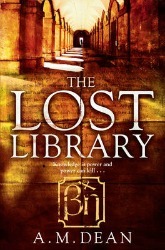 To summarise; 'The Lost Library' is a strong debut from an author, who while still learning his trade shows enough promise to make me want to read his next book. "Let's hope Mr. Barclay is already hard at work on his next bestseller..."
Keisha's latest mark is a man whose wife disappeared a week ago. She's seen him on TV, pleading for his wife to come home, or, if she's been abducted, pleading with whoever took her to let her go. Keisha knows a payoff when she sees one. So she pays a visit to our troubled husband and tells him her vision. The trouble is, her vision just happens to be close enough to the truth that it leaves this man rattled. And it may very well leave Keisha dead. What were you thinking, Mr. Barclay?? 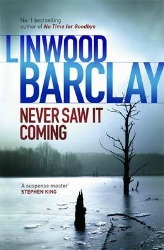 Linwood Barclay is one of my favourite crime authors and when 'Never Saw it Coming' started slowly I was not concerned as I have yet to read a book by him that has disappointed me. However, as I continued I kept having a feeling of deja vu as not only did the name of the main character, Keisha Ceylon seem familiar, but also one of the threads of the plot. I was slightly thrown as there is an additional part of the story that has been added, in my opinion, to fill the pages. Even with the additions the book is only around 200 pages which is comparatively short for a book in this genre. Further reading confirmed my suspicions and indeed, 'Never Saw it Coming' is a rehash of a short story written by Barclay which was originally titled 'Clouded Vision'. I definitely 'Never Saw It Coming' and was very disappointed with the plot that I felt wasn't strong first time and even weaker the second time around. Whilst this may be acceptable as a short story, I do not feel it is written to the same high standard of this author's previous novels which I thought were outstanding. Maybe the book was better than I am giving it credit for but I do feel slightly conned. As an avid fan of Barclay I have read all that he has written so I feel that by changing a title but not the story I have been cheated. This simply feels like a 'cut and paste' job. There is no mention on the book of this being a rework so if you have already read 'Clouded Vision' I would not recommend reading this book. Let's hope Mr. Barclay is already hard at work on his next bestseller and will deliver a much better effort than this poor rehash.